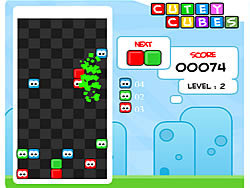 Cutey Cubes is a cute and addictive block stacking puzzle game. Place blocks in rows of four or more to eliminate all the ones with eyes. Control the falling pieces with the arrow keys. Play against a friend or try to complete all the levels!